“Let us keep this Thanksgiving Day sacred, thanking God for the bounty and goodness of our nation. As a measure of our gratitude, let us rededicate ourselves to the preservation of the land of the free and the home of the brave.” Ronald Reagan, Thanksgiving Day, 1985 Ever since the first Thanksgiving Day on October 3, 1789, when President George Washington issued the first Thanksgiving Proclamation in history, America has never stopped giving thanks to Almighty God for her abundant blessings. 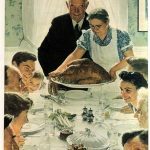 In the Proclamation, Washington stated: “Whereas it is the duty of all nations to acknowledge the providence of Almighty God, to obey His will, to be grateful for His benefits, and humbly to implore His protection and favor.” As we gather with family and friends to celebrate Thanksgiving, call to mind all that God has provided, and ask that He forgive our national sins and continue to bless our Nation. .